You “forgot” Ron Paul, Todd. I’m sure you just couldn’t fit him on that big screen of yours. 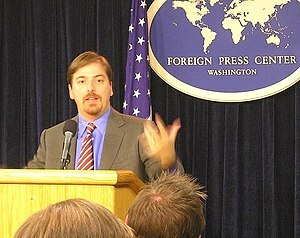 I think I saw Chuck Todd on Capitol Hill on my December 2008 trip to Washington, D.C. He passed by so suddenly that my hesitation in being sure it was him ruined the chance to say something meaningful. At the time, I was wondering what he had to say about 9/11. I’d still like to ask him about that. Only this time, I’d specifically like to ask him what he thinks about the flight school owner, Rudi Dekkers, saying the alleged ringleader of the 9/11 hijackers, Mohamed Atta, was never seen praying in the special area he had set up, and that it wasn’t Atta’s voice on the purported cockpit recording that officials say was his. For more on Meet the Press, see my article, Meet the Press not the longest-running television show due to superior research and guests.